Murad AHA Rapid Exfoliator® Anti-Aging Facial- Fine lines and wrinkles ease as concentrated Glycolic Acid exfoliates away dead skin cells. A unique patented blend of antioxidants, anti-inflammatories, and hydrators soothes and revitalizes skin to reveal a softer, smoother complexion. When performed in a series, your esthetician will gradually increase the strength of each treatment, progressively improving skin’s texture, tone and youthfulness with each facial. Ideal for all skin types. 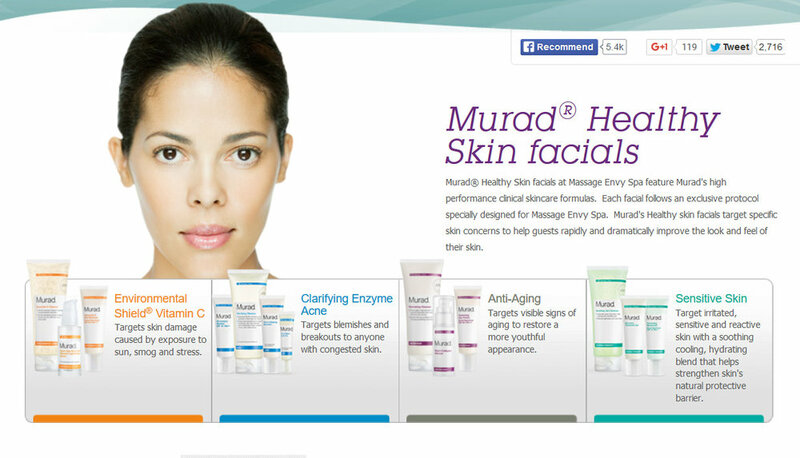 Murad Acne Complex® Facial- Acne breakouts are complex, that’s why this facial is designed to reduce acne blemishes and improve skin clarity and while instantly soothing redness and inflammation. This professional-strength acne treatment features exfoliating fruit enzymes to open clogged pores for deep cleansing and extraction without irritation. Suitable for all levels of acne severity, this powerhouse acne treatment is also available to help control breakouts on the back and décolleté. Add on to your facial with Murad Firm and Tone Body Treatment- Reduce the signs of cellulite and stretch marks while increasing skin firmness and elasticity with the most acclaimed results-oriented cellulite treatment in the world. Murad’s cellulite treatment begins with a thorough exfoliation of problem areas, followed by a deep, highly concentrated infusion of pure Vitamin C and a localized massage. A unique, scientifically formulated recipe is then applied to minimize imperfections and nourish skin.